When the stylish new 2013 Lexus GS350 hits showrooms next year, it will be heralded by the brands first Super Bowl commercial in addition to sponsorship of the Sports Illustrated Swimsuit edition. The fourth-generation GS was revealed this summer at the Concours d’Elegance and has made its auto show debut during the currently running Los Angeles Auto Show. The all-new sport sedan incorporates the new Lexus design philosophy, prefaced by the new spindle grille. The new GS reportedly has a higher level of precision handling and driver response. Whether sweeping through a curve or orbiting a tight corner, the 2013 GS350 displays a solid stance and confident handling. These characteristics result from the 3.5-liter, 306 horsepower V6 engine, which can propel the 2013 GS 350 from 0-60 mph in 5.7 seconds. That’s not bad for a sedan nearly 16-feet long and weighing close to two tons. The engine utilizes dual overhead cams and 24 valves with dual continuously variable valve timing with intelligence (VVT-i) along with Direct and Port Injection. The throttle control is electronic with intelligence (ETCS-i) and the 2013 GS350 has a penchant for 91-octane premium unleaded. Remarkably, the GS still meets the requirements to achieve a ULEV-II EPA designation. The 3.5-liter 6-cylinder engine is mated to a 6-speed sequential-shift with paddle shifters plus ECO, Normal, Sport S, Sport S + (on some models) and Snow driving modes. The cabin is spacious with the expected Lexus luxury appointments, including white LED ambient lighting and an analog clock. Cabin materials include three types of wood offset by elegantly detailed contrasting stitching on the guage housing, door trim, center console, shift knob and steering wheel. 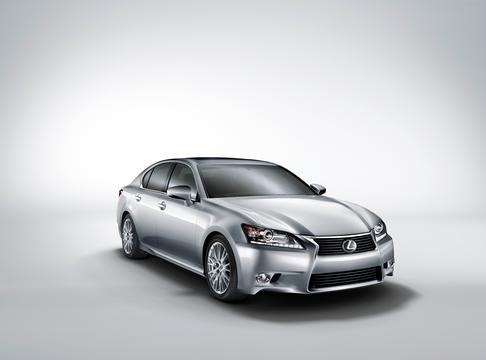 A highlight of the new 2013 GS350 is the next-generation of Lexus Enform with Safety Connect. This advanced telematic system connects to music, information and entertainment services through a smart phone. Apps include Bing for local search, OpenTable, MovieTickets.com, Pandora, iHeartRadio, Facebook and Yelp. A text-to-speech aspect allows the driver to hear text messages and reply with already prepared responses. DVD audio and video compatibility, along with HD Radio with iTunes tagging and a three-month trial subscription to SiriusXM Satellite Radio come standard. The 2013 GS 350 will be available in both rear-wheel drive (RWD) or all-wheel drive (AWD) configurations, and can be equipped with the available Premium, Luxury or F SPORT packages to suit the buyers taste and proclivities. Next spring, the GS 450h hybrid will arrive to complete the line-up. With a total system power output of 338 horsepower, the GS 450h not only has the power of a V8, but is projected to exceed most competitive V6s in fuel mileage with EPA-estimated ratings of 29 mpg city, 34 highway and 31 mpg combined. More insights on the 2013 Lexus GS350 will be forthcoming when TorqueNews attends the media introduction, slated for Las Vegas Nov. 30. Watch for it.